Musings on Markets: Netflix: The Future of Entertainment or House of Cards? For better or worse, Netflix has changed not just the entertainment business, but also the way that we (the audience) watch television. In the process, it has also enriched its investors, as its market capitalization climbed to $139 billion in March 2018 and even after the market correction for the FANG stocks, its value is substantial enough to make it one of the largest entertainment company in the world. Among the FANG stocks, with their gigantic market capitalizations, it remains the smallest company on both market value and operating metrics, but it has almost as big an impact on our daily lives as its larger peers. This may come as a surprise to some, but Netflix has been publicly listed for longer than Facebook or Google. The difference between Netflix and these companies is that it’s climb to stardom has taken more time. Don't get me wrong! 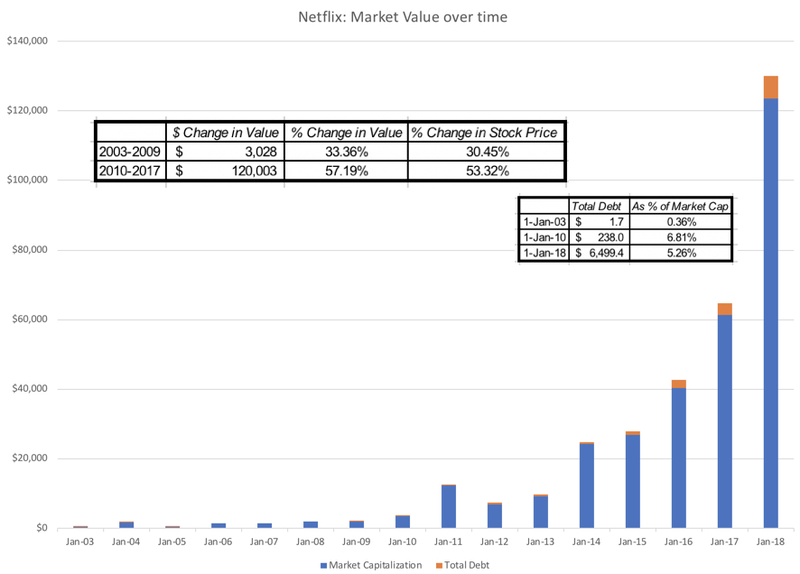 Netflix was a very good investment between 2003 and 2009, increasing its market capitalization by 33.36% a year and its market capitalization by about $3 billion, during that period. However, it became a superstar investment between 2010 and 2017, adding about $120 billion in value over the period, translating into an annual price appreciation of more than 50% a year. The fuel that Netflix has used to increase its market capitalization is its subscriber base, as with the other FANG stocks, the company seems to have found the secret to be able to scale up, as it gets larger. That subscriber base, in turn, has allowed the company to increase its revenues over time, as can be seen in the picture below, summarizing Netflix’s operating metrics. 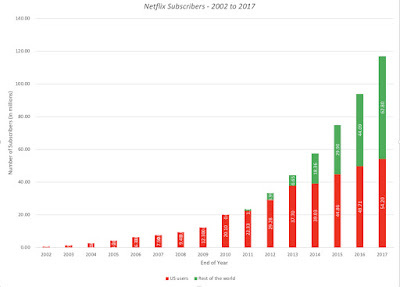 You can accuse me of over analyzing this chart, but it captures to me the essence of the Netflix success story. While Netflix has been able to grow revenues in each of the three consecutive five-year time periods, 2002-2006, 2007-2012 and 2013-2017, that it has been existence, the company has been faced with challenges during each period, and it has adapted. DVDs in the Mail: In the first five-year period, 2002 through 2006, the company mailed out DVDs and videos to its subscribers, challenging the video rental business, where brick and mortar video rental stores represented the status quo, and Blockbuster was the dominant player. The Rise of Streaming: It was between 2007 and 2012, where the company came into its own, as it took advantage of changes in technology and in customer preferences. First, as technology evolved to allow for the streaming of movies, Netflix adapted, with a few rough spots, to the new technology, while its brick and mortar competitors imploded. Second, while Netflix saw a drop in revenue growth that was not unexpected, given its larger base, it also saw its content costs rise at a faster rate than revenues, as content providers (the movie studios) starting charging higher prices for content. The Content Maker: In hindsight, the studios probably wish that they had not squeezed Netflix, because the company reacted by taking more control of its own destiny in the 2013-2017 time period, by shifting to original content, first with television series and later with direct-to-streaming movies. The results have upended the entertainment business, but more critically for Netflix, they show up in a critical statistic. For the first time in its existence, Netflix saw content costs rise at a rate slower than its growth in revenues, with operating profit margins, both before and after R&D reflecting this development. 1. It's a big spender on content: In 2017, Netflix spent billions on the content that it delivers to its subscribers, and the extent of its spending can be seen in its financial statements. The way that Netflix accounts for its content expenditures does complicate the measurement, since it uses two different accounting standards, one for licensed content and one for productions, but it capitalizes and amortizes both, albeit on different schedules, and based upon viewing patterns. The gap between the accrual (or amortized) cost (shown in the income statement) and the cash spent (shown in the statement of cash flows) on content can be seen in the graph below. In 2017, Netflix spent almost $9.8 billion on content, though it expensed only $7.7 billion in its income statement. If this divergence continues, and there is no reason to believe that it will not, Netflix’s profits will be more positive than their cash flows by a substantial amount. Note that this divergence should not be taken (necessarily) as a sign of deception or accounting game playing. 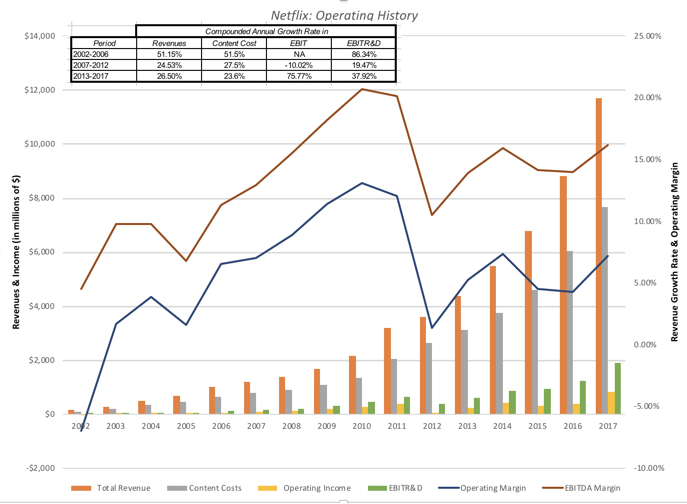 In fact, if Netflix is being reasonable in its amortization judgments, one way to read the difference of $2.14 billion ($9.8 in cash expenses minus $7.66 billion in accrual expenses) is to view it as the equivalent of capital expenditures at Netflix, since it is expense incurred to attract and keep subscribers. The pace is not letting up. In the first quarter of 2018, Netflix introduced 18 new television series and delivered 12 new seasons of existing series, prodigious output by any studio’s standards. There are three reasons for the Netflix move into the content business. The first, referenced in the last section, is to gain more control over content costs and to be less exposed to movie studio price hikes. The second is that Netflix has been using the data that it has on subscriber tastes not only to direct content at them, but to produce new content that is tailored to viewer demands. The third is that it introduces stickiness into their business model, a key reason why new subscribers come to the company and why existing subscribers are reluctant to abandon it, even if subscription fees go up. Netflix has moved beyond television shows to making straight-to-streaming movies, spending $90 million on Bright, a movie that notwithstanding its lackluster reviews, signaled the company’s ambitions to be a major player in the movie business. 3. Netflix has been adept at playing the expectations game: One feature that all of the FANG stocks trade is that rather than let equity research analysts frame their stories and measure their success, they have managed to frame their own stories and make investors and analysts play on their terms. Netflix, for instance, has managed to make the expectations game all about subscriber numbers, and every earnings report of the company is framed around these numbers, with less attention paid to content costs, churn rates and negative cash flows. After its most recent earnings report in January, the stock price surged, as the company reported an increase of 8.3 million in subscribers, well above expectations. 4. The company is globalizing: One consequence of making it a numbers game, which is what Netflix has done by keeping the focus on subscribers, is that you have to go where the numbers are, and for better or worse, that has meant that Netflix has had to go global, with Asia being the mother lode. 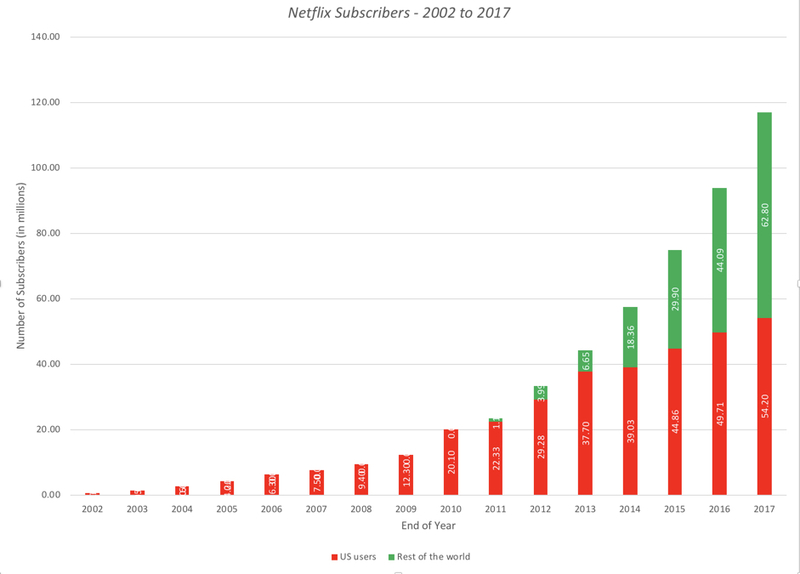 At the end of 2017, Netflix had more subscribers outside the US than in the US, and it is bringing its free spending ways and its views on content development to other parts of the world, perhaps bringing Bollywood and Hollywood closer, at least in terms of shared problems. In summary, Netflix has built a business model of spending immense amounts on content, using that content to attract new subscribers, and then using those new subscribers as its pathway to market value. It is clear that investors have bought into the model, but the model is also one that burns through cash at alarming rates, with no smooth or near term escape hatch. In keeping with the focus on subscriber numbers that is at the center of the Netflix story, I will value Netflix with the subscriber-based approach that I used to value Spotify a few weeks ago and Uber and Amazon Prime last year. 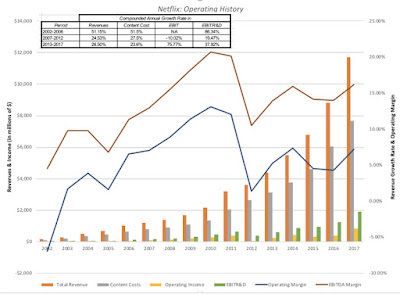 Since Netflix does not break its costs down into my preferred components I made subjective judgments in allocating these costs, treating G&A costs as expenses related to servicing existing subscribers and marketing costs as the costs of acquiring new subscribers. With content costs, I started first with the $2,146 million difference between the cash content cost and expensed content cost and treated it also as part of the cost of acquiring new subscribers. With the expensed content cost of $7,600 million, I assumed that only 20% of these costs are directly related to subscribers and treated that portion as part of the cost of servicing existing subscribers and that the remaining 80% would become part of the corporate cost, in conjunction with the investment in technology and development. One key difference between the Netflix and Spotify cost models is that most of the content costs are fixed corporate costs for Netflix but almost all content costsare variable costs for Spotify, since it pays for content based upon how its subscribers listen to it, rather than as a fixed fee. A strength that Netflix has built, perhaps with its original content, is that it has reduced it's churn rate (the loss of existing customers), each year since 2015. In 2017, the annual renewal rate for a Netflix subscription was about 91%, and that number improved even more across the four quarters. In my subscriber-valuation, I have used a 92.5% renewal rate, for the life of a subscriber, assumed to be 15 years. I will assume that Netflix investments in original content will give it the pricing power to increase annual revenue per subscriber (G&A and the 20% of content costs), which was $113.16 in 2017, at 5% a year, while keeping the growth rate in annual expenses per subscriber at the inflation rate of 2%. I estimate after-tax operating income each year, using a global average tax rate of 25%, and discount it back at a 7.95% cost of capital (estimated for Netflix, based upon its business and geographic mix, and debt ratio) to derive a value of $508.89 subscriber and a total value of $59.8 billion for Netflix’s 117.6 million existing subscribers. To value a new subscriber, I first estimated the total cost that Netflix spent on adding new subscribers by adding the total marketing costs of $1,278 million to the capitalized portion of the content costs of $2,142 million, and then divided this amount by the gross increase in the number of subscribers (30.84 million) during 2017, to obtain a cost of $111.01 for acquiring a new subscriber. I then net that number out from the value of an existing subscriber to arrive at a value of $397.88/new subscriber right now; I assume that this value will increase at the inflation rate over time. I assume that Netflix will continue to add new subscribers, adding 15% to its net subscriber rolls, each year for the first five years, and 10% a year for years 6 through 10, before settling into a steady state growth rate of 1% a year. Discounting the value added by new subscribers at a higher cost of capital of 8.5%, reflecting the greater uncertainty associated with new subscribers, yields a total value of $137.3 billion for new subscribers. The final piece of the puzzle is to bring in the corporate costs that we assumed could not be directly linked with subscriber count. In the case of Netflix, the technology & development costs and 80% of the expensed content, that we put into this corporate cost category amounted to $6.13 billion in 2017 and the path that these costs follow in the future will determine the value that we attach to the company. I assume that technology & development costs will grow 5% a year, but it is on the content cost component that I struggled the most to estimate a growth rate. I decided that the accelerated spending that Netflix had in 2017 and continued to have in 2018 reflect Netflix’s attempt to acquire standing in the business, and that while it will continue to spend large amounts on content, the growth rate in this portion of the content costs will drop to 3% a year, for the next 10 years. Note that even with that low growth rate, Netflix will be consistently among the top five spenders in the content business, spending more than $100 billion on original content over the next ten years. Discounting back the after-tax corporate expenses back at the 7.95% cost of capital, yields a corporate cost drag of $111.3 billion. To value Netflix, I bring together the value of existing and new subscribers and net out the corporate cost drag. I also subtract out the $6.5 billion in debt that the company has outstanding and the value of equity options granted over time to its employees. The value per share of $172.82 that I estimate for Netflix is well below the stock price of $275, as of April 14, 2018. 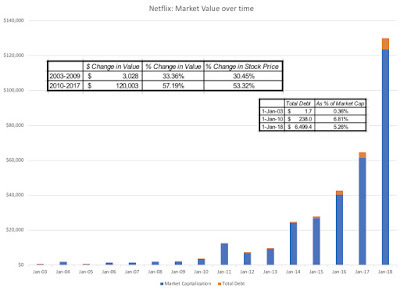 My value reflects the story that I am telling about Netflix, as a company that is able to grow at double digit rates for the next decade, with high value added with new users, while bringing its content costs under control. I am sure that your views on the company will diverge from mine, and you are welcome to use my Netflix subscriber valuation template to come to your own conclusions. It is worth taking a pause, and considering the differences between Netflix and Spotify, both subscription-based business models, that draw their value from immense subscriber bases. By paying for its content, both licensed and original, and using that content to go after subscribers, Netflix has built a more levered business model, where subscribers, both new and existing, have higher marginal value than at Spotify, where content costs are tied to subscribers listening to music. The Netflix model, which is increasingly built around original rather than licensed content, provides for a stronger competitive edge, which should show up in higher renewal rates and more pricing power, adding to the value per subscriber, both existing and new. The Netflix model will deliver higher value from subscription growth than the Spotify model, but it comes with a greater downside, because a slackening of that growth will leave Netflix much deeper in the hole, with more negative cash flows, than it would Spotify. Now that both companies are listed and traded, it will be interesting to see whether this plays out as much larger market reactions to subscription number surprises, both positive and negative, at Netflix than at Spotify. 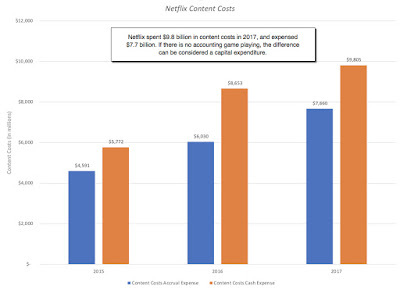 To illustrate the dangers to Netflix of letting content costs grow at high rates, note that the company’s equity value becomes negative (i.e., the company goes bankrupt), if content costs grow at high rates, relative to revenue growth, with double digit growth rates creating catastrophic effects. 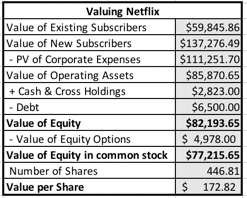 If Netflix is able to cap the costs at 2017 levels in perpetuity, the estimated value per share is approximately $216, at the base case growth rate of 15%, and if it is able to reduce content costs in absolute terms over time, it is worth even more. In my view, investing in Netflix is less a bet on the company being able to deliver subscriber and/or revenue growth in the future and more one on the future path of content costs at the company. There is no doubt that Netflix has changed the way we watch television and the movies, and it is changing the movie/TV business in significant ways. By competing for talent in the content business, it is pushing up costs for its competitors and with its direct-to-streaming model, putting pressure on movie theaters and distribution. That said, the entertainment business remains a daunting one, because the talent is expensive and unpredictable, and egos run rampant. The history of newcomers who have come into this business with open wallets is that they leave with empty ones. For Netflix to escape this fate, it has to show discipline in controlling content costs, and until I see evidence that it is capable of this discipline, I will remain a subscriber, but not an investor in the company. Facebook: Friendless, But Still Formidable! Amazon: Glimpses of Shoeless Joe! Why have you not valued Netflix based upon the conventional dcf, reflecting operating profits and reinvestment? There is a typo in the box which says Spotify instead of Netflx. If we view content costs as IP cost then the context changes . Hollywood has run out of original IPs and soon the OTT streamers too will hit a roadblock. The content investments of today will result in iconic IPs which can be milked via prequels, sequels and maybe the franchise model.Todays content spend must also factor in the IP creation , which will be viewed as an asset in the future. Many thanks for speaking to our Valuations class at the University of Foster last week. Is there a reason why you have not included operating leases, and content obligations (including those that have not been accounted for on the balance sheet) in your market value of debt? The most recent 10k notes "Our streaming obligations include large multi-year commitments. As a result, we may be unable to react to any downturn in the economy or reduction in our cash flows from operations by reducing our streaming content obligations in the near-term. This could result in our needing to access the capital markets at an unfavorable time, which may negatively impact our stock price."